Zimbabwe’s 2019 National Budget, taglined “Austerity for Prosperity” presented a raft of measures meant to address the challenges faced in the economy. The measures put in place include reduction in government expenditure financing through treasury bills and central bank overdraft facility, introduction of the 2% IMT tax, payment of taxes in US dollars where the underlying transactions are in foreign currency the introduction of Nostro FCA accounts. These interventions have resulted in a myriad of challenges for organisations. The budgets have been constrained by the loss of purchasing power of balances held as a result of price increases emanating from the parallel market local balance value erosion and increased bank charges. Fuel shortages and hampered organisations’ ability to travel, accommodation costs have sky rocketed, quotations’ validity period has been reduced to a day at worst and five days at best. In compliance with the law and their existing systems and procedures, organisations have been forced to use hard currency balances to procure goods and services whose prices have increased astronomically. The recent increase in fuel prices pushed the citizens beyond tolerance resulting in demonstrations that took place during the #ZimShutDown week, leading to destruction of property, injuries and loss of life. For organisations, the shutdown caused the loss of days as employees could not travel to work whilst others sought temporary refuge in neighbouring countries. Funders have expressed concern over the excessive force used by the government in response to the demonstrations. Austerity is not a new phenomenon in the global economy. The whole of Europe went through varying degrees of austerity since the global economic crisis of 2008. The common tools used in austerity were decreased government spending, increased taxes, increased retirement age, and tightened social security and job security nets. As a result, the austerity measures led to reduced household incomes, increased unemployment rates and less support for the underprivileged members of the society. In all the European countries under austerity budgets, there were instances of social unrest and protests. For example, in Greece, riots erupted frequently and the country's near-daily strikes and demonstrations shut down schools, airports, train stations, ferries and harmed medical services. Calls for national shut downs as a result of Zimbabwe’s austerity measures are the normal societal response when squeezed by unfavourable economic policy. During austerity, it becomes more difficult for Non-Profit Organisation to operate as the communities will be marred by clashes between security forces and protesters. Furthermore, some of the NPO employees may be directly affected by the unrest, rendering it difficult to execute activities as planned. However, it is also during these times that the services of NPOs are needed by the society. The need for livelihoods support is increased by the reduced household incomes, worsened unemployment rates and the increased vulnerability of the underprivileged previously catered for by government social safety budgets. Clashes between security forces and protesting civilians always leads to unwelcome casualties, prompting human rights advocacy organisations to action. Therefore, rather than folding hands waiting for the crisis to be over, NPOs in Zimbabwe should be geared up for more activity in the short-term. Since organisations are used to operating in a stable environment, they need to be innovative and adjust to ensure that they continue operating amidst any instability that might or might not occur. Furthermore, the economic environment is peculiar, text book solutions will not work perfectly. The sustainability of organisations will require much adaptability and flexibility. Organisations and households alike are starting to feel the pinch (a gross understatement) of the austerity measures introduced late 2018. The 2% Intermediated Money Transfer Tax, coupled with the parallel market ‘exchange rate’ differential between RTGS balances and hard currency has negatively impacted on the general price levels, with inflation having reached a 10-year high of 42.1% year-on-year (Zimbabwe National Statistics Agency (ZimStat), 2018). This is before the possibly imminent price increases to be brought by the sharp increase in fuel prices as announced on January the 12th. Whilst most organisations receive most of their funding in hard currency, they still need to operate within budgets whilst legally complying with the 1:1 rate between the US Dollar and RTGS balances. Due to the unfamiliar nature of economic dynamics in Zimbabwe (for example that money in the bank is worth less than bond note cash, which is also worth less than hard US Dollar despite officially being said to be at par), some funders do not have a full understanding of the way things are operating in Zimbabwe, save for the few who have visited and had a chance to experience the situation. As a result, requests by local organisations are sometimes seen as mere justifications to present the begging bowl. Without the knowledge of how to relate with the “donors”, it would be difficult to obtain any technical or monetary assistance. The economic policies also brought in a new creature called Nostro FCA accounts, where most of new funds are being directed. The channel through which money flows when transferred through the Nostro platform has brought unwelcome delays at best. At the worst, some transactions cannot go through! This has rendered some conventional systems and procedures useless and difficult to comply with. The need to hold huge cash balances have brought unwelcome risks to organisations. The #ZimShutDown that occurred during the week 14 to 18 January 2019 made organisations realise that it is actually possible for there to be no meaningful activity for A WEEK!!! This has begun igniting conversations about the relevance of disaster management in the Zimbabwean context. How should organisations ensure that they continue operating during and beyond social unrest? How should they adjust their activities in the event of instability? What alternative communication channels should be explored in the event of blockage of the internet? What are the critical skills needed to ensure continued operation during crisis? What adjustments are needed in organisational structures and procedures to enable flexibility? How can organisations engage donors for continued support amidst crisis? Should organisations look for alternative sources of funding? 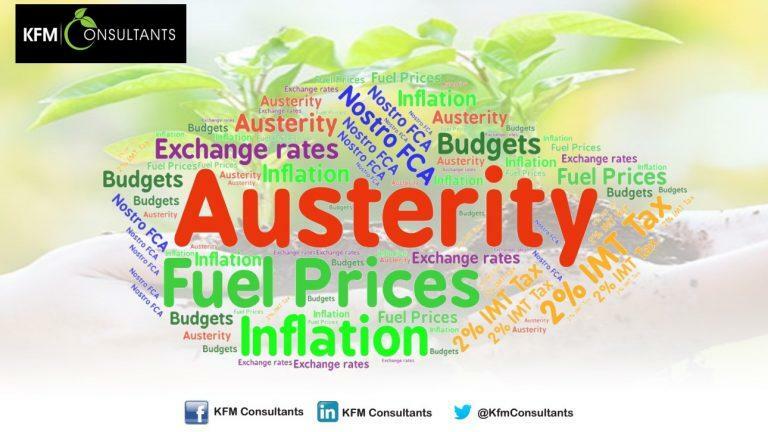 During the first week of February, KFM Consultants will be hosting free workshops to share ideas on how to manoeuvre in the current environment. The workshops will be open for all NPO practitioners – finance, programmes, management, boards.